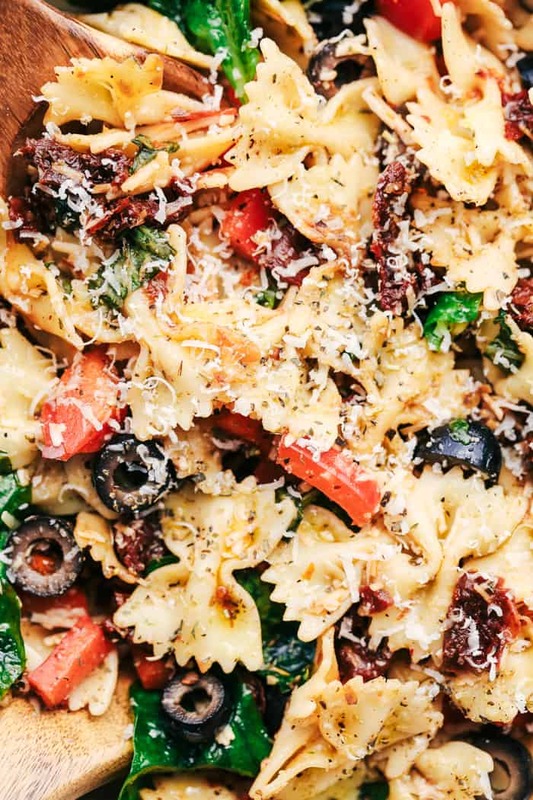 This recipe was inspired by our local market that creates delicious pasta salads. I was in the end of my pregnancy and we wanted to have our friends over for a barbecue. Because I was so uncomfortable and just weeks away from having my baby, I really didn’t want to spend a whole lot of time in preparing for a barbecue. So I bought this Tuscan Pasta Salad and it was the hit of the BBQ. I knew that I had to recreate it at home with a few of my personal touches! 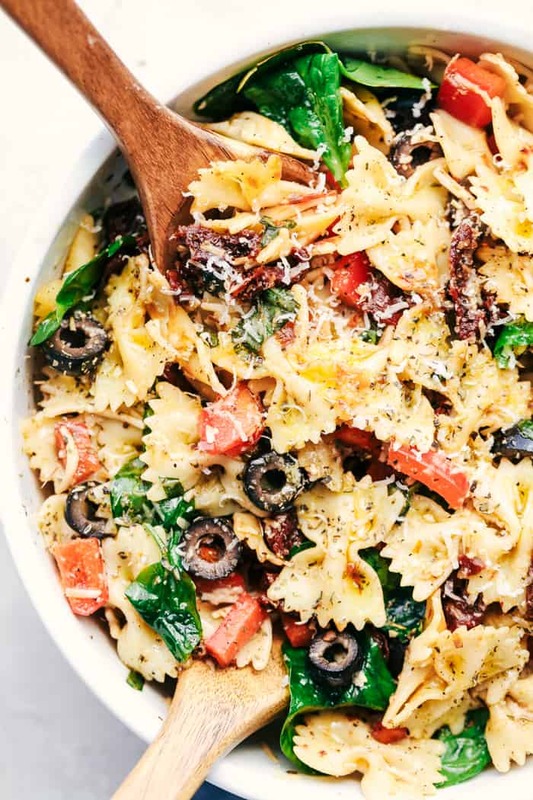 This pasta salad is so simple to create but big on flavor. 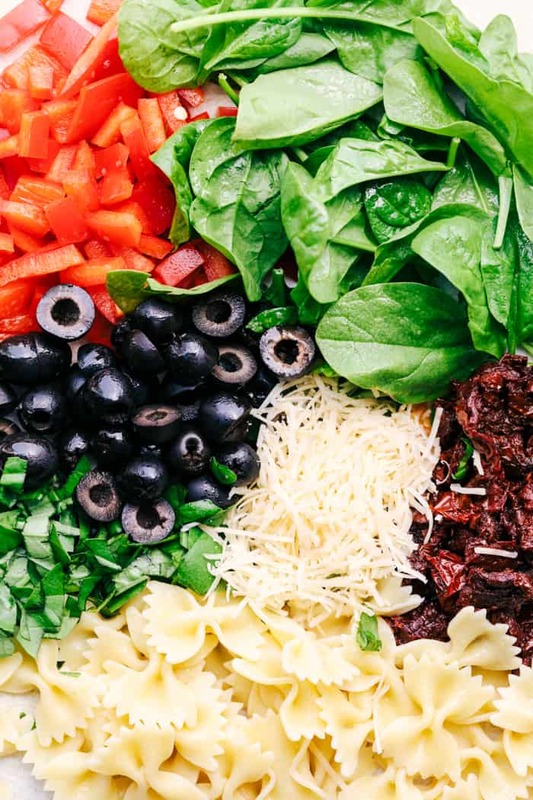 The original one from our local market just had peppers, sun dried tomatoes, and olives, but adding the spinach gave it an extra pop of color and was the perfect addition. This pasta salad was perfect! It was a great change from the traditional pasta salads and was such a huge hit. 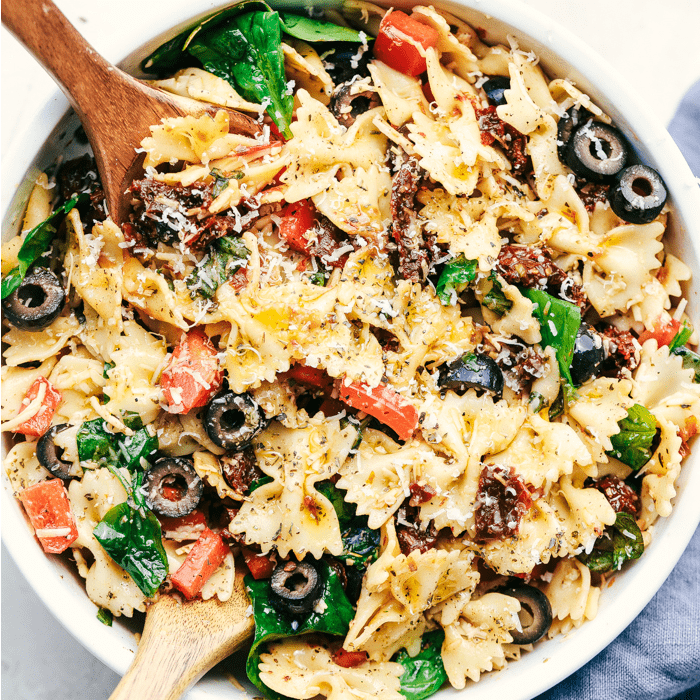 The tuscan flavors came together so well in this easy to make pasta salad. It is absolutely perfect for your next potluck or summer gathering. This salad gets tossed with the best homemade tangy dressing. I also love that it gets tossed with freshly grated parmesan cheese. Because cheese is life. Am I right? You are going to love this recipe just as much as we did! Perfect I need a salad for a get together tomorrow, I think this will be perfect! Thanks and congratulations on the new little one!??? Just mad it and I was AMAZING!!! Can’t wait to try more recipes. This was good. Would be extra yummy with some mozzarella chunks!! Or even a little rotisserie chicken. 🙂 Thanks for the recipe! Did you really use a 17 Oz jar of sun dried tomatoes? I am having a difficult time finding more than 1.7 Oz jars. I haven’t made this yet but I found it and it looks really good. We feed 55 xc boys and this might work!!! I read this as “1 (one) 7 ounce jar.” They often come in 7 ounce jars. It still says 1 7oz jar. Is it 1.7oz or 7oz jar? do you leave the garlic whole or do you mince it for the dressing? I’m planning on making this for tomorrow! Thank you for the recipe! Its a unique salad! OK made this today and it was AMAZING!! I loved everything about it. I added some bacon and put extra spinach in it so it was more like a green salad. It was so good and it was a hit with my friends! Do you serve this (pasta) hot or chilled? Can I make day before or better to serve immediately? Made this pasta salad and it was the best ever! Easiest recipe too! Great, thank you. Making it now for later lunch today. My guests loved this, even took some home. Excellent recipe. Will make again. Followed recipe exactly except added some thinly sliced salami. 16 ounce of pasta?? Is that right? Excellent! Just the right amount of spice. I added a little lemon juice to the dressing. This recipe is outstanding. I bought rotisserie chicken from the grocery store and added it. I also did goat cheese! Highly recommend. Amazing post Alyssa. 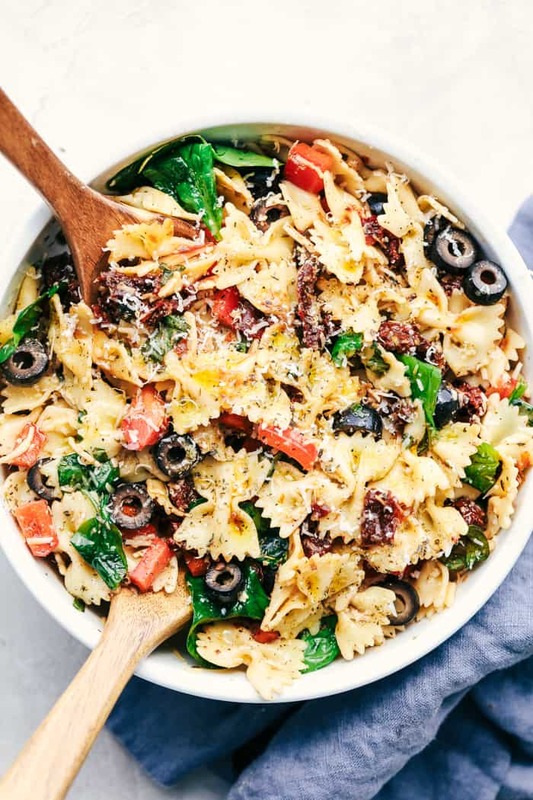 Your Tuscan Salad Pasta looks delicious. The best part is that you’ve used ingredients that are commonly available. Use of olive oil to make pasta gives it a great flavor. Olive oil has good fats to keep the heart healthy and helps keep blood pressure in check. That looks amazing and has all the flavours I love. I am rather partial to a pasta salad and make them regularly. I will add this one to my must-try list. Sharing this now! Thank you for sharing this delicious recipe! Absolutely loved it. My husband and I fought over the leftovers. Am planing to make again this weekend for potluck BBQ. Can’t wait to share with family and friends. I’m having trouble sharing your recipes to Pinterest. Any suggestions? I can share them to Facebook. This looks great! I plan to add chickpeas for protein and omit the Parmesan cheese to make it vegan. Went looking for this pasta salad after I tasted it at my local Harmons. Saw you were also from Utah, so this has to be the stuff! Stoked you put together a recipe for it, can’t wait to mix it up!